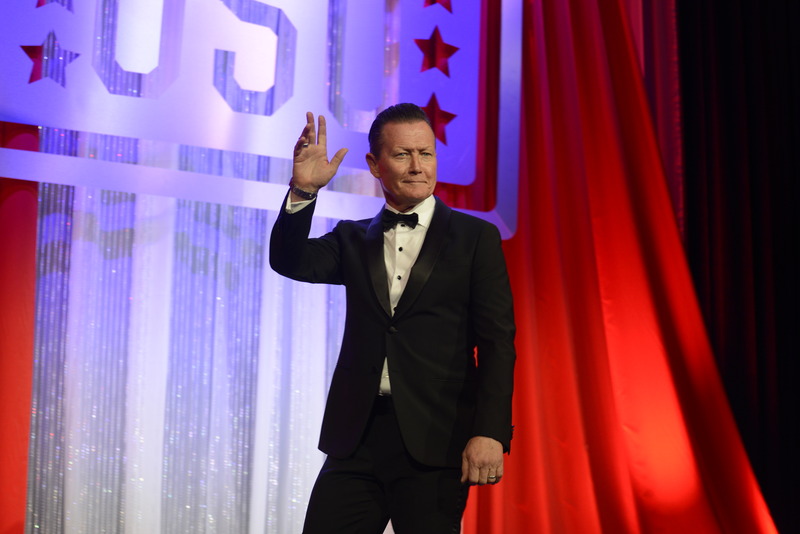 Actor Robert Patrick is often recognized for his role as Cabe Gallo on CBS's hit show Scorpion or from playing T-1000 in Terminator 2, or from Identity Thief or Wayne's World or The Sopranos. But when Vice President Joe Biden said, "I know you" to Patrick at the Vice President's residence on Monday night, the actor was overwhelmed. "It floored me right there," he recalls the next day. "I think I mumbled something back. I get star-struck too, and was trying to maintain my composure. And I think I floated out of there." Dr. Jill Biden had invited the 2015 United Service Organization's (USO) Service Members of the Year, Volunteers of the Year, and their families to join her at the residence to thank them for their heroism and service. That the Vice President attended was a happy surprise. Patrick, on the other hand, had more than earned his invitation. He has visited and entertained more than 9,700 troops and military families since 2008. That includes five USO tours to such places as Djibouti, Bahrain, Kuwait, Iraq, Qatar, and Afghanistan. He has also visited wounded troops at Walter Reed. And on October 20, he was Master of Ceremonies at the annual USO Gala in Washington DC. Patrick's devotion to the USO dates back to fond childhood memories of his grandfather who was an Army officer. While starring in The Unit - based on the exploits of the US Army's Delta Force - Robert Patrick was asked to join a USO tour. "I told them I don't do anything. I don't sing or dance. But they said the troops would respond to my work," he recalls. "Before I left, several of my buddies who had served in Vietnam showed me photos of themselves with Nancy Sinatra and said the USO shows got them through the war. So I got it. I went overseas and just talked to them and asked where they were from, shook their hands, had lunch with them." He particularly remembers a tour with costars Dennis Haysbert and Max Martini and baseball great Tommy Lasorda. "We got together with a Catholic priest at a military base in Afghanistan and we took communion with the troops. The gals and guys really dug it." Robert Patrick plays a heavy most of the time, but is the antithesis of one in real life. He gets emotional talking about the USO and the men and women he's met: "I'll be in North Carolina at a restaurant when I'm visiting my mom, and someone will say, 'Hey I met you in Iraq.' That means a lot to me. And it follows the USO's credo of bringing a piece of America to our troops. We support them." An avid motorcyclist, the actor is proud of riding his bike from California to Washington for the annual Rolling Thunder event held on Memorial Day. The Vietnam Veterans Memorial - which Patrick calls "the Wall" - has great significance to him. "That war in particular had a huge impact on my life when I was younger," he says. "I love Washington. I love the monuments, and the pomp and circumstance, the Tomb of the Unknown Soldier." He seems to be a man who is comfortable in his own skin, who even as he plays "menacing and tough guys" is quick to lend a hand to those who have defended our country. As he prepared to host the USO gala before over a thousand people, he said, "I just don't want to screw up. I want to try to pronounce everyone's name correctly, and I want everyone to know I'm sincere. To be with all those heroes is a much more profound experience than they will ever know."